Nero has tons of different Devil Breakers he can use in the game. Each of his arms has its own special abilities, but none are quite as unique as the Punch Line. If you want to zoom around the battlefield, here’s how to ride Nero’s Punch Line in Devil May Cry 5. Nero can equip tons of different arms and even switch between them on the battlefield. It’s important to bring the right one during fights, but if you want to have a little more fun, you can bring the Punch Line. 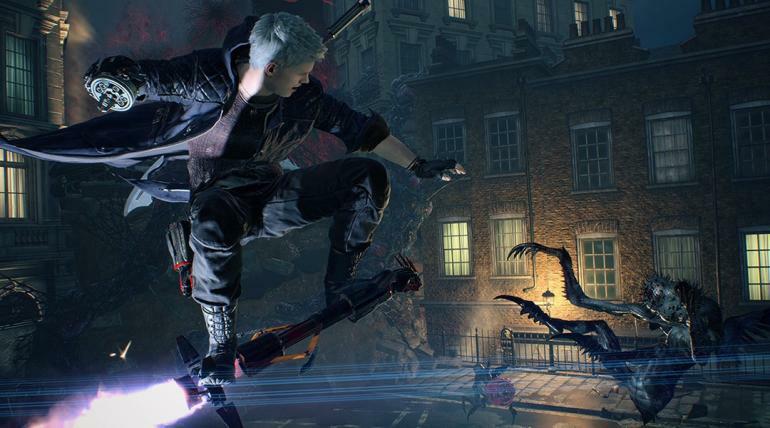 Also known as the Flying Haymaker, this crazy Devil Breaker in Devil May Cry 5 is fueled with jet propulsion power that lets Nero detach the arm to send it flying. Any enemies caught up by the Devil Breaker will suffer some serious damage, making it a pretty nifty weapon. On top of that, Nero can even hitch a ride and kill enemies in style. Throw the Punch Line using Circle/B. It will then automatically fly to the nearest enemy. When the weapon comes back to you, hold down the same button you used to launch it. Nero will then automatically ride the Devil Breaker. When riding the Punch Line, Nero can attack enemies with a flip kick using Triangle/Y. Meanwhile, pressing Square/X will make him spin rapidly, damaging enemies that get too close. You can press Circle/B to gain some serious air time, or you can press the jump button to dismount from his arm in Devil May Cry 5. Riding the Devil Breaker is a great way to earn style points and S ranks, so make sure to bring it along with you. That about wraps up everything you need to know about how to ride the Punch Line in Devil May Cry 5. For more tips and tricks on the game, check out our expansive wiki.